Body fat analyzer has a compact and light design that's perfect for travel and everyday use. 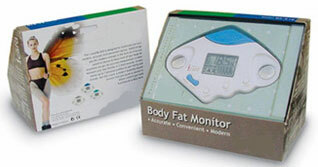 This fat analyzer calculates the body fat. This body fat scale device is considered as one of the most accurate and easily accessible methods of determining body fat levels.This health detection product is a revolutionary body fat analyzer. With its slim, modern shape this body fat percentage hi-tech product, responds to the frenzy rhythm of the modern world and makes analyzing body fat an easy one-step process. Body fat monitor is an ideal mobile personal digital assistant for body fat control, and makes measurement possible at anytime, anywhere. The easy-to-use buttons and graphic display LCD allows one to complete measurement in just 5 seconds. 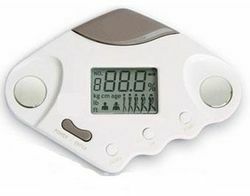 A sharable body fat meter records up to 7 users. Body fat monitor is an ideal mobile personal digital assistant for body fat control. 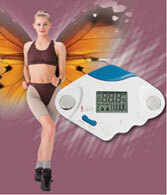 Body fat analyzer are compact and light. Shows body fat percentage and graphical indication of body fat types. Rapid measurement in just 5 seconds. Memory stores up to 8 personal profiles. Automatically turns off when left idle.